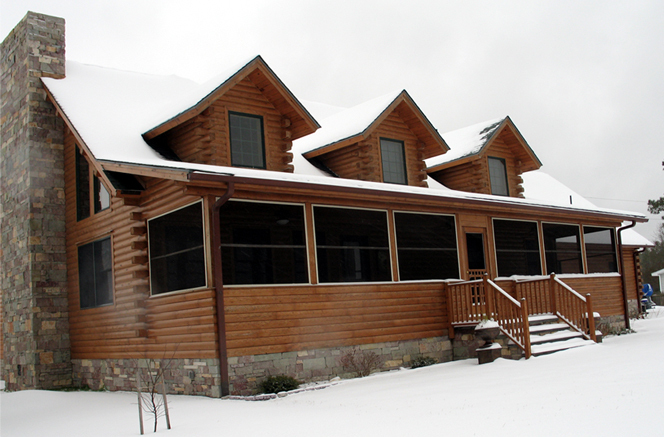 When Karl Stansell and his wife decided to build a custom log home in Hertford, NC in 2007, conventional forced air heating was not a part of their plans. “We don’t like forced air,” Karl explained. “It is not energy efficient and just blows dust around your house. We were convinced Infloor radiant heating was the way to go,” he said. They heard about Infloor Heating Systems and after some research, decided it was the only way to go. Infloor conducted a heat analysis on the 3,000 sq. 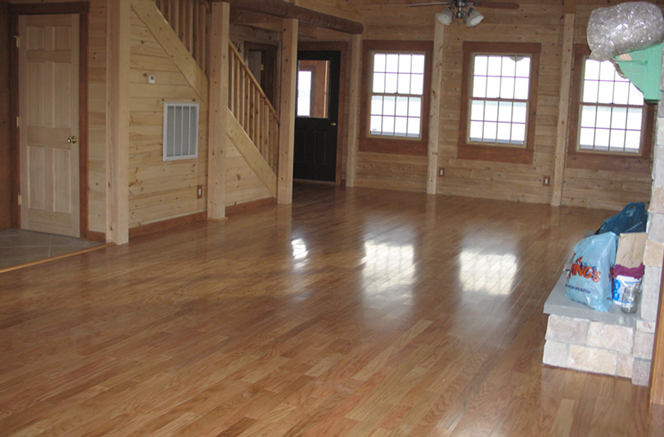 ft. house and recommended Warmboard as the sub-flooring for the system. Hi Valley Supply, based in Buena Vista, CO, provided all other supplies as a distributor of Infloor Heating Systems. The floor coverings included 3/8” wood flooring throughout most of the house with ceramic tile in the kitchen and bathrooms. Karl decided on five zones for the house, which included a finished room above the garage. “If I was to do this over again, I would have had the radiant heating installed in the garage floor and would have made the master bathroom its own zone,” he admits. 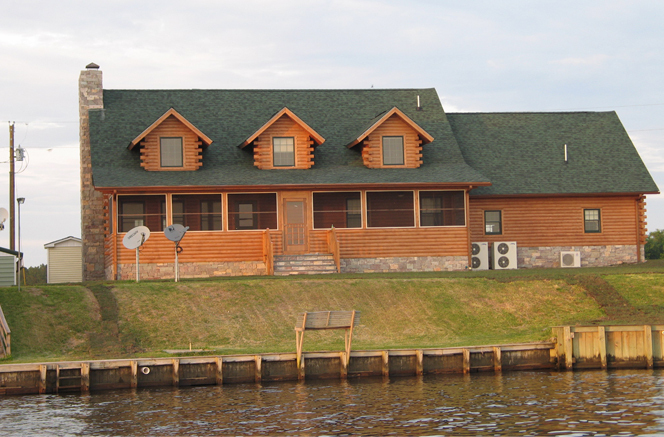 The log home is located on a riverbank in a rural area and uses propane as the main fuel source. Infloor radiant heating uses very little electricity, saving them money. The house sits on a 4’ tall concrete foundation with a crawl space below that is also fully concreted and sealed. Lighting was installed in the crawl space and includes a dehumidifier to keep the moisture under control. All the piping for the radiant heating system was installed in the crawl space, along with the ducts for their central air conditioning system. 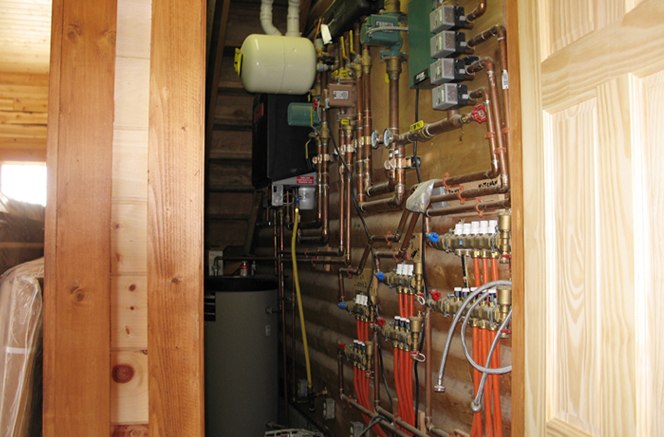 The mechanical room is located in the garage and includes an MC Series boiler that runs 19,000 – 80,000 BTUs and hangs on the wall, along with the brass manifolds, pumps, copper piping, and side-arm tank. The control board was pre-piped and pre-wired, and includes a TN4 tekmar control system with indoor/outdoor reset, and controls domestic hot water production and zone synchronization for the Infloor radiant heating system. “We recommended the MC-80 boiler because it is located in the garage,” explained Infloor President Michael Willburn. “The boiler has to be at least 18” off the floor to avoid any possible gasoline vapors,” he identified. Infloor Heating Systems was a part of the project from beginning to end. “We worked with Karl for almost a year before launching their Infloor radiant heating system,” said Michael, who flew to North Carolina to personally dial in the system for peak performance. “The system is energy-efficient, there is absolutely no noise, and the cleanliness is unmatched,” Karl continued. “And it is really nice to get up in the morning and put your feet onto a warm floor. I always make sure to mention it and definitely recommend it,” he concluded.